Sunrise Park on the afternoon of Easter Sunday. The structures will be removed and the playground replaced. Part of the delay was the result of rules regarding wetlands. Even though the land has been surrounded by urban development for generations and has no waterways or swamps, part of the park, including the playground itself, was found to be a wetland protected by state and federal regulations. This meant the city had to get permits before doing any construction. To get the permits, it was necessary to buy credits for two-thirds of an acre of wetland, Anne Catlin told me. She runs the federal community development block grant program for Albany, and the program paid a wetlands bank owned by the city of Eugene $38,225.80. For the Sunrise Park renovation, the grant program has allocated another $239,000 in its draft budget for 2017-18. Part of the federal program’s purpose is to reduce “blighting influences in low- and moderate-income neighborhoods,” a description that fits census tract 208 in the Sunrise Neighborhood. 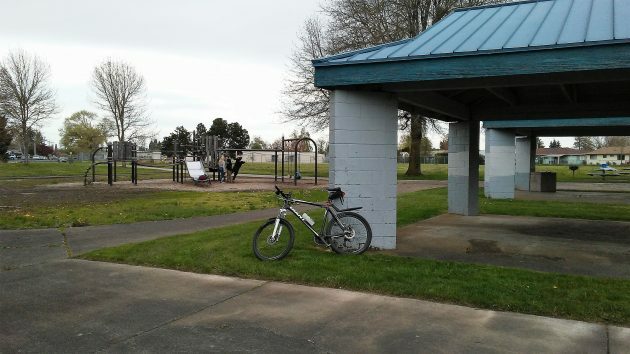 The park project, according to the city plan, “will be replacing dated and vandalized play equipment … with new equipment and amenities, new lighting, paths, and a parking lot.” The existing shelters will be removed.